Water footprint totals have been tossed around in this time of low reservoir levels and little rain (don’t we all know that it takes a gallon of water to grow an almond?). But to answer this riddle, first I must introduce the concept, “color of water.” Water footprint researchers assigned colors to water to help differentiate the types of water sources: blue, green and gray. Blue water is sourced from aquifers, reservoirs and rivers that scribble across the landscape. Rain water and moisture is green. Gray is water tainted with nitrogen, the run-off from fertilizer and manure. If we consider water footprint totals alone, then the soy burger with a water footprint of 224 gallons per pound is a superior choice. But if the soy burger originates in a field irrigated by ground or surface water, it has a water footprint of 224 gallons of blue water, water from above and below ground reservoirs. And the gray water totals are higher too if grown on fields treated with chemicals fertilizers. If the pound of hamburger is from a pasture-raised cow on a diet of rain-fed grass, it’s 1,851 gallons of green water, rain. 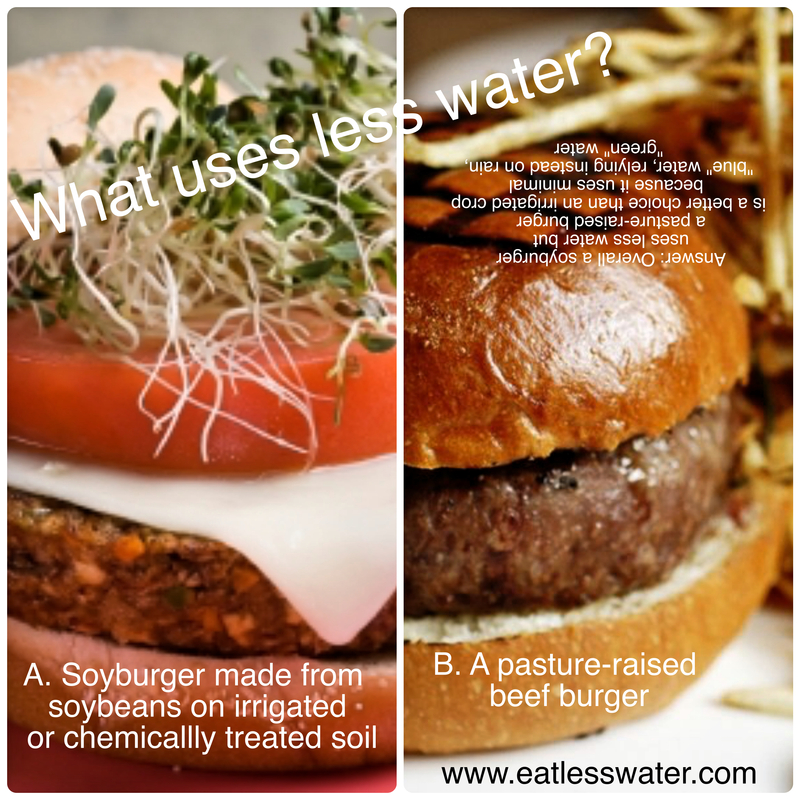 Even with an overall higher water footprint total the rain-fed beef hamburger is a better choice. It isin’t simply knowing the water footprint of food that matters, but rather the source of water. When we know the color of water and begin to support farmers who utilize more “green” water and cultivate the soil to “keep” more water when it rains, we can positively impact water systems around the world.